My sons have a dolly each. One is named Coco and the other is Lebecka (go figure). While they love their trucks and other so called ‘boy toys’, whenever I see them playing with their babies it warms my heart and makes me smile. They love tucking Coco and Lebecka into little made-up beds on the floor, pretending to spoon-feed them, zooming around the yard with them in strollers and sweetly kissing their plastic dolly heads. Awww, I think. I hope they are lucky enough to become real dads one day! Coco and Lebecka are teaching them how to nurture and to be dads. Here are six other great lessons I can see my boys learning from playing with dolls. My sons love toy cars, building a train track and they idolise Spiderman, but they are also very into throwing pretend tea parties, playing with magic wands and giving Coco and Lebecka a bath. At their age, toys are just toys. Something all kids love and they are not strictly just for boys or just for girls. This should be the case for lots of things in life. My youngest is such a rough nut. His idea of showing his brother affection is to thump him, but when he hold’s Coco he is so very gentle. 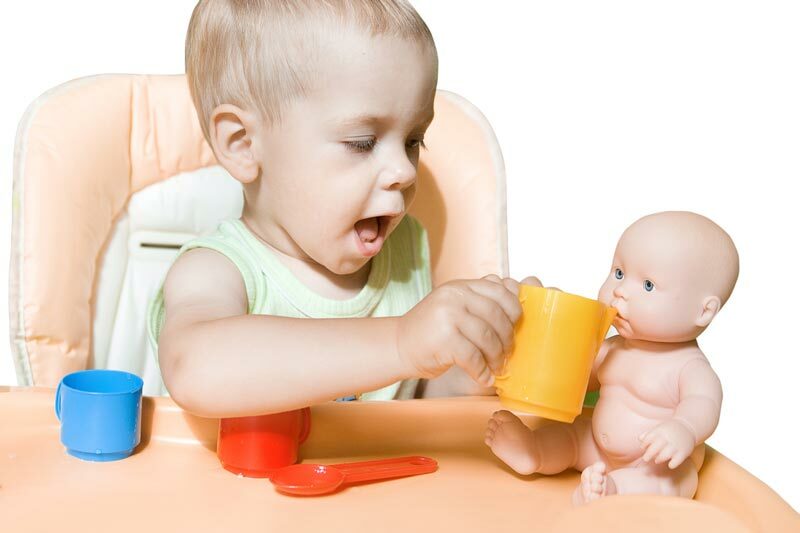 Having a doll has shown him how to hold a baby carefully and to be gentle not only with his voice when talking or singing to him, but also with his hands. When Lebecka had a ‘fall’ the other day (because my son pegged her from the top of the back steps), my eldest boy rushed to pick her up. While gently patting her and using his most soothing voice he said, “Don’t worry, I’ll get you a bandaid.” Then to me, “Lebecka has an owie, Mummy. Poor Lebecka.” My boys’ dolls are helping them to feel and to show empathy. When I see my sons playing with their dolls I talk to them about how they might have babies of their own one day and become dads. They are learning that taking care of a child is a joy for both mums and dads, and that parenting isn’t just something mothers do. Coco and Lebecka love to go shopping using the boys’ toy cash register and my sons act as the shop keepers. They also love birthday parties and blowing out the ‘candles’ on a play dough birthday cake. Role playing is great for little ones to make sense of their world and to understand it in a fun and imaginative way. The boys’ dolls really help to bring this to life. It’s strange to even be writing about this now (feminism has come so far) but our boys will grow up with the message that girls can do whatever they want and that their gender shouldn’t dictate their future career or life choices. Playing with dolls is teaching my sons that they can also do whatever they want or be whoever they want. That it’s just as cool to be loving and nurturing as it is to be wild, adventurous and ambitious.